Rose essential oil has a deep, sweet, flowery smell. The rose essential oil is mixed with an odourless coconut light oil, so the blend’s aroma is purely of rose. Rose essential oil is one of the best multi-purpose essential oils available, similar in usefulness and versatility to lavender. The aroma may give a feeling of well-being and happiness. It is said to soothe and harmonise the mind, body and spirit. Therapeutically, rose essential oil is popular for enhancing the mood. On the skin, rose essential oil is good for all skin types especially dry, mature, rough and irritated skin. It helps to moisturise and rehydrate the skin, repair broken capillaries and calm inflammation and irritation. The petals from the roses are harvested just after the dew (by 8am). The extraction process is then started immediately. The rose absolute is obtained by using the solvent extraction method, which yields higher quantities of essential oil than the steam distilled process. 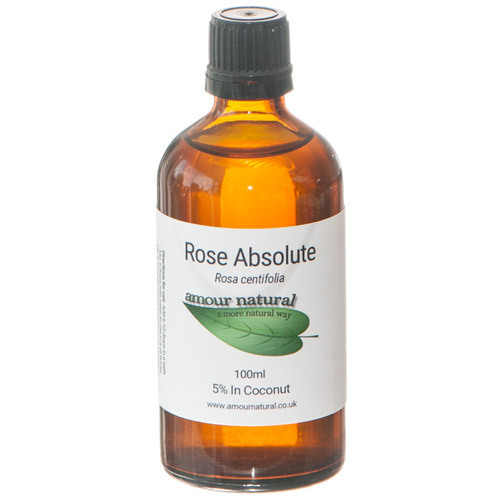 Rose Absolute Oil, 5% Dilute in Coconut Oil. Below are reviews of Amour Natural Rose Absolute Essential Oil - 100ml by bodykind customers. If you have tried this product we'd love to hear what you think so please leave a review.